A wedding ring is often viewed as a symbol of eternity, the band signifying the never-ending love between the couple. 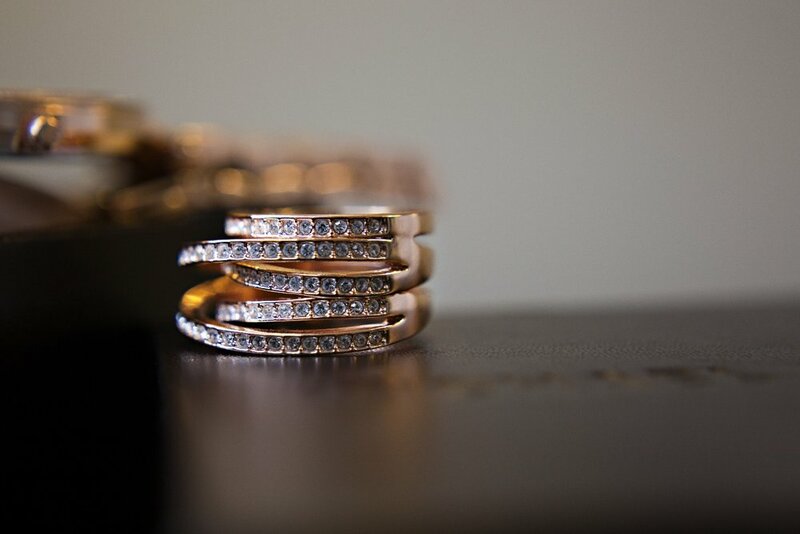 It is believed that the first wedding rings were seen in Egypt around 3000 years ago! The wedding ring is worn on the third finger of the left hand as it was believed that the vein in this finger led straight to the heart. There’s a tradition that states that when buying an engagement ring, the groom should spend the equivalent of three months salary… I think this is a bit of an old fashioned tradition now. A lot of brides have an idea of the kind of engagement ring they would like and will often know what suits them. For example, I’ve never liked gold jewellery, it just doesn’t look right on me so all of my jewellery is silver or white gold. The experience of shopping for an engagement ring together is a great thing to share and marks the start of the wedding planning process too. All of our couples tell us their proposal story and it’s surprising how many times the proposal is followed by engagement ring shopping! My husband proposed to me without a ring, I think because he knew I would like to choose something and also I’m not entirely sure that the proposal was planned! I’m definitely the ‘planner’ in our family! It happened on a Sunday morning so we headed into town the same day. Unfortunately a lot of the jewellery stores were closed so I ended up with a £5 Argos ring, and we headed back to town a few days later to purchase another ring! I still wear both! Whereas for Tori, who got engaged last year, her engagement ring was passed down to her from her grandmother, who had secretly arranged to give Gryphen (Tori’s fiancé) her antique ring so he could propose with it when he felt the time was right - that happened to be on holiday in America on the anniversary of when they first started dating! I was thrilled to receive the picture of her with the ring the next day! When it comes to wedding rings, I really like it when people think outside the box. There’s no rule that states the rings have to be identical or even complimentary! A friend of mine is a tree surgeon and he had a wooden wedding ring made for him, his wife has a more traditional wedding band. My husbands wedding ring is made from titanium as he didn’t want a ‘shiny’ wedding ring. My ring is white gold with diamonds so they certainly don’t match. There are lots of things to consider when choosing your wedding rings. You will likely be wearing this piece of jewellery every single day for the rest of your life so you need to fall in love with it, it also needs to be comfortable and practical for your daily routine. A good place to start is to think about the type of metal; traditional yellow gold, rose gold, white gold, platinum, titanium. Then there is the shape; court shape (rounded on the inside and out), flat profiles (completely rectangular), D-shape (flat on the inside, round on the outside) amongst other options. Finally you could have a diamond(s) set in the ring or another stone, an inscription engraved inside, even fingerprints. One of our brides this year had a completely unique engagement ring that had been designed around a beautiful yellow sapphire the groom selected, so for her wedding band the fit next to the beautiful stone on her engagement ring was really important! Once you have selected your rings and the big day arrives, think about how you would like them to be presented on the wedding day. Traditionally the best man will take care of the rings and have them ready at the crucial moment during the ceremony, but you may have an alternative. One of our past clients had their dog take part in the wedding ceremony as the ring bearer, the rings were tied to his collar in a small ring box! If you already have a child together it’s a good way to include them in the ceremony with the important role of ‘ring security’. The wedding ring is the symbol of marriage that confirms your commitment to one another. On the wedding day, and for some time afterwards, people will ask to see your wedding rings so look after your hands and get a manicure before the big day!